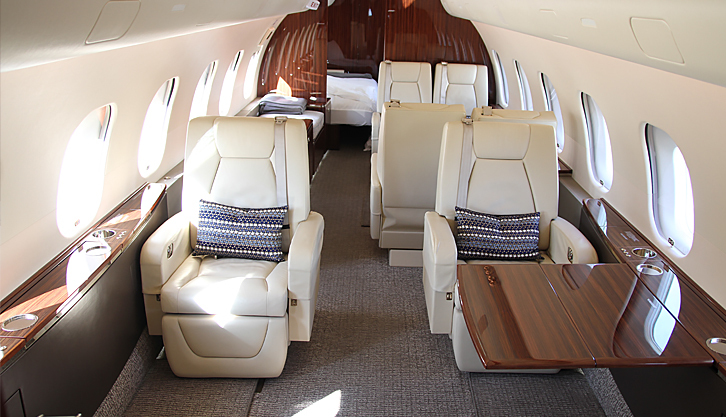 The Global 5000 delivers unmatched performance, comfort and reliability with features and benefits that combine to deliver a value proposition unmatched in its class. 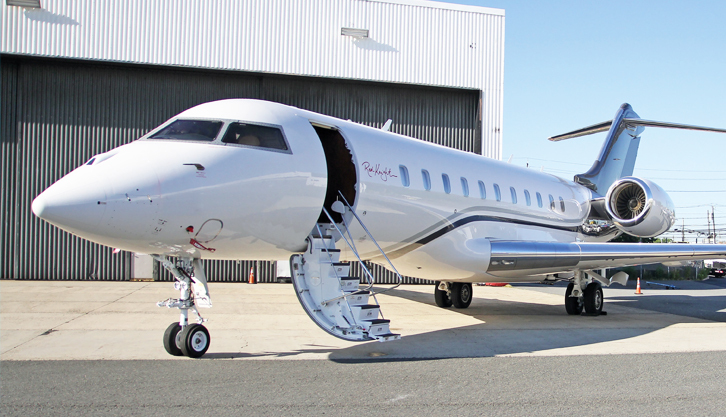 With power and performance to get you closer to your destination, the Global 5000 aircraft accesses more of the world's most challenging airfields and business hubs. • The RHS and LHS Forward Cabin includes four (4) single wide seats with recliner style footrest, electric lumbar, seat pan levelers (LHS and RHS aft seats), berthable/recline, and swivel capability. 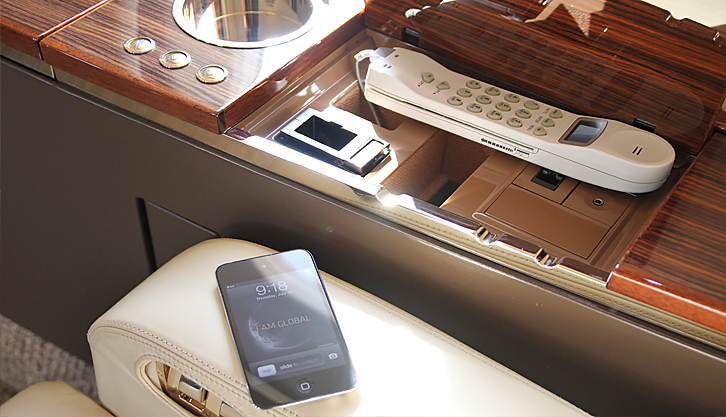 • The RHS Mid Cabin Credenza contains the entertainment source equipment and the combination fax/printer. • The LHS Mid Cabin Conference Group includes two (2) sets of double seats that provide full forward and aft tracking, with the ability to swivel each inboard seat. • The LHS Aft Cabin includes two (2) single narrow seats with recliner style footrests, electric lumbar, seat pan leveler, berthable/recline, and swivel capability. • Opposite one (1) 16G rated berthing divan equipped with telescopic shoulder harness posts is installed. 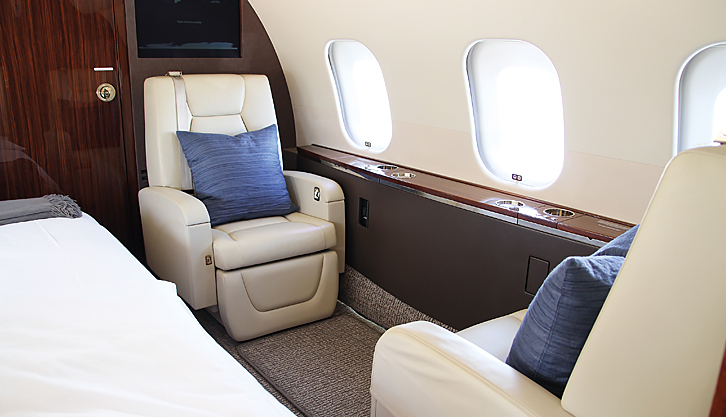 • The divan has take-off and landing seating for two (2) passengers when the removable bulkhead is installed, and three (3) passengers when the bulkhead is removed. • An Audio/video system is installed to display movies and other video information. • Each of the monitors is able to independently display any available video source. 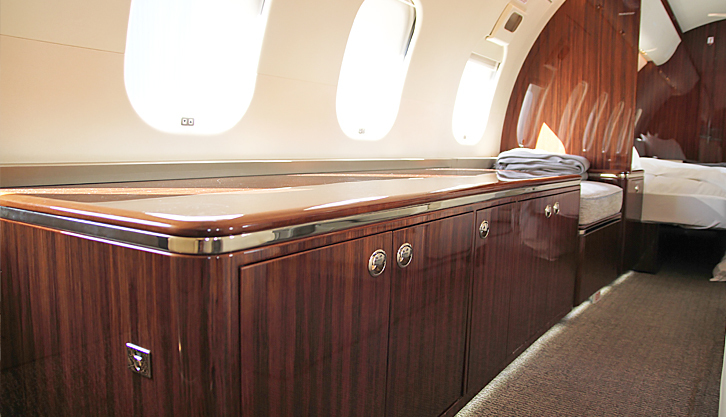 • The Aft Area includes a lavatory, a vanity and an aft wardrobe. • It also includes a baggage compartment complete with a fold-up hang-up bar, a 60 inches (152 cm) removable hang-up bar, two (2) fold down shelves and miscellaneous storage, including areas fore and aft of the AC Power Center. • 1000 hour check: Last at 3747hrs. Next due at 4797hrs. • 1500 hour check: Last at 2972hrs. Next due at 4497hrs. • 3000 hour check: Last at 2972hrs. Next due at 6000hrs. • 450L check: Last at 874. Next due 1350. • 900L check: Last at 875. Next due 1800. • 15 month check: Last January 2018. Next Recommended December 2018. • 30 month check: Last January 2018. Next Recommended March 2020. • 60 month check: Last January 2018. Next Recommended September 2022.